LOSE weight, look better, feel happier. If your new year resolutions included any - or all - of the above, then 2017 is the year to start taking care of your gut. Your gut has a huge influence on your overall health. An imbalance or lack of certain gut bacteria can cause all sorts of trouble, including problems losing weight, a weakened immune system, poor skin, and even mental health issues. Eating well is the key to creating a healthy gut flora and good digestion. 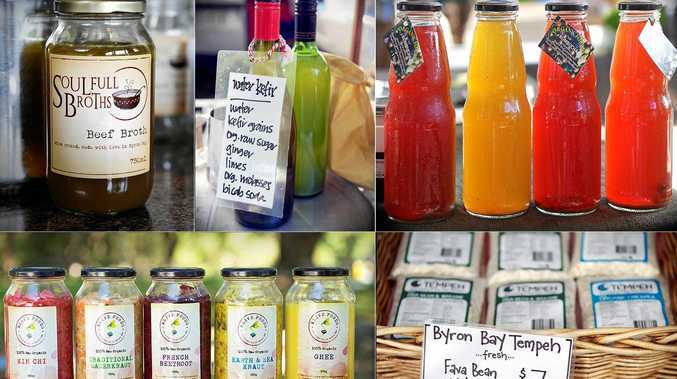 Cut back on the sugar and processed foods, eat more fresh fruit and vegetables, and top up your gut's good bacteria with probiotic-rich fermented foods, such as the local products listed below and available at the Mullumbimby and New Brighton farmers' markets. At its most basic, sauerkraut is just fermented cabbage and salt, but local kraut enthusiasts Anna Surrey and David Mendes, of Byron Bay Alive Foods (Mullum/New Brighton), add extras like dill, juniper berries, seaweed, ginger and turmeric to up the flavour factor and the goodness. They also create a fermented beetroot and a spicy kimchi, both of which are teeming with healthy bacteria. It's all raw and unpasteurised, which preserves all of the probiotic benefits. This fermented drink is made with kefir grains, and either water or milk. The milk version has a sour tang, like yoghurt, and can be used in many ways - drink it straight, add to smoothies, use in place of buttermilk, or even make it into ice cream. Nimbin Valley Dairy (New Brighton/Mullum) and Cheeses Loves You (Mullum) both make a milk kefir, including a goat milk version, while Heart Breads (New Brighton/Mullum) makes a refreshing water kefir flavoured with ginger. Tempeh is traditionally made from fermented soybeans, but Sarah Bourke, of Byron Bay Tempeh (Mullum/New Brighton), creates her's with chickpeas or fava beans. The end product is packed with the same good bacteria, is highly nutritious, and easy to digest. This fermented tea is full of gut-friendly bacteria. Served ice cold, it's a great summer refresher. Sue Mangan of Organic Forrest (Mullum) flavours her kombucha with organic home-grown ingredients including hibiscus, elderflower, ginger, turmeric and lemon, which also have anti-inflammatory properties. Most commercially-available olives are pasteurised (heat treated) to give them a good shelf life, but the ones from Grumpy Grandma Olives (Mullum/New Brighton) are fresh and raw. There is no heating, so the good bacteria remain intact. They taste pretty amazing, too. It may not be a fermented food, but bone broth is rich in minerals and compounds and is known for its ability to help heal the gut and promote healthy digestion. Available from Soulfull Broths (Mullum).